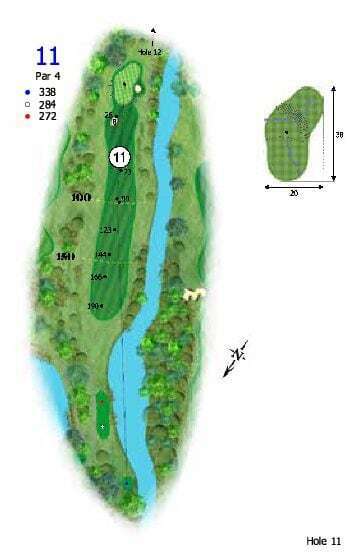 The eleventh hole is a narrow straight par 4. A waterway runs adjacent to the hole down the right hand side. Bunkers at the front and right of the green guard the difficult three tier green which can provide some testing two putts. Being straight is the key to a par on this hole. Safe Play: Play to the left of the fairway with a long iron or utility wood, this green can be very tricky so just play to the middle and 2 putt for par. Aggressive Play: Hit driver off the tee, the fairway will feed your ball closer to the green, setting you up with only a wedge left, which will help you stop your approach shot quickly on this tricky tiered green.